With plenty of moving services, Meathead Movers is fully prepared to get you settled in your new home. Our Pasadena movers are clean-cut student-athletes, dedicated to fulfilling all your moving needs efficiently. When most people think of Pasadena, the Rose Bowl and the Rose Parade come to mind. Those events delight Pasadena residents too, but there’s a lot more to enjoy about this lovely community. If you are looking for a pleasant place to live that’s within easy driving distance of downtown Los Angeles, Pasadena is an excellent choice. 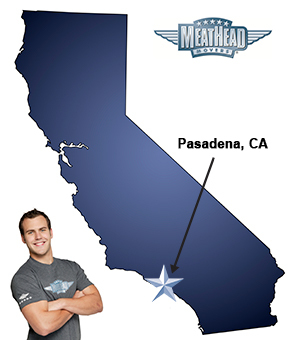 For exceptional Pasadena movers, Meathead Movers is the best option around. With its central location in the San Gabriel Valley, Pasadena is also remarkably beautiful, and is called the Crown of the Valley for a reason. As one of the oldest cities to border Los Angeles, the city has evolved to showcase its proud history and its strive for the future. As the home of the California Institute of Technology, which has produced several Nobel Prize winners, Pasadena’s population of more than 130,000 people is dominated by professors, students, and business professionals. In addition to a diverse population of highly educated people, your neighbors will include a famous population of non-indigenous parrots. No one is quite sure how they ended up in Pasadena, but they add a little flair to the area. Pasadena has an abundance of activities to satisfy any interest! Residents and visitors will love to explore downtown Pasadena, where you’ll find museums, restaurants, and independent theater houses. Pasadena’s excellent nightlife is centered in its Old Town neighborhood, which is in the western part of the city. For upscale shopping and dining, you can’t go wrong with the city’s South Lake district. By living in Pasadena, you’ll be able to pay regular visits to the Huntington Library. The book selection there is superb, but the real excitement lies in its 150-acre botanical garden. For a little lighthearted fun, make sure to check out the annual Doo Dah Parade. Participants dress up, act silly and have a lot of fun. If you’re ready to get the ball rolling on your move, our Pasadena movers are ready to assist you. Our moving company specializes in local, long-distance and commercial moves to or from Pasadena. We also provide reliable packing, storage, on-site relocations, and our distinctive moving concierge service. All of our student-athlete Pasadena movers are thoroughly screened and trained before their very first move. When you entrust your move to Meathead, you can rest assured knowing that your move will be a success because our professionally trained student-athlete movers are the best movers the industry has to offer. Meathead Movers’ talented student-athlete crews will carefully move your belongings and have you settled into your new Pasadena home in no time. We can provide you with all your moving necessities from utility companies to eBay consignment dealers. With our help, you’ll be able to hit the ground running and start exploring your new city as quickly as possible. In fact, you can see what your neighbors in Pasadena have to say about us! Contact us today to book your move or to schedule a free, no-obligation estimate. With a 100% satisfaction guarantee, you have nothing to lose! Moving to Pasadena? Here are some helpful resources. Great service by very attentive workers. Awesome leadership. Angel and Isaiah were both a great help. Worked hard, fast and safely. I appreciate Meathead Movers help and would recommend and or use again if needed, thanks. Meathead was fantastic. On time and very personable staff. Will definitely use them again for any move in the future. This was a big move for me...a major change in my life, and a move from Pasadena to the Central Coast of California. Meathead was amazing. I have never seen such efficiency, the packing of the truck was complete poetry! Like a perfect game of Tetris! But the most important thing was the courteous, enthusiastic truly great attitude of the guys, especially the Mentor, Antonio. At a time when customer service seems all too much like a thing of the past, Meathead obviously trains and recruits with just this in mind - truly helpful young men who know the value of making people feel as comfortable as possible on a day that would otherwise be pretty stressful. I was impressed...and gratefl. Thanks, Meathead!